An essential factor for quality in industrial production is accuracy—in terms of both product manufacture and quality inspection. HEIDENHAIN presented innovative solutions for these two areas and their digital networking at Control 2018. These include high-precision single units such as the LIP 6000 exposed linear encoder and the QUADRA-CHEK 2000 evaluation units as well as highly integrated systems such as the SRP 5000 angle encoder module. The Connected Machining package of functions networks the production plant individually with all areas of the company accompanying production. This in turn enables the seamlessly digital exchange of data from order planning to quality inspection. A high-precision rotary axis is an extremely complex construction. It is therefore simpler for a machine manufacturer to implement a highly integrated assembly with tested and specified properties instead of numerous separate components. A system solution, after all, significantly relieves the manufacturer in terms of construction, mounting and adjustment. 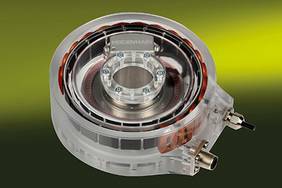 HEIDENHAIN with its SRP 5000 presents a system solution that integrates the bearing, encoder and torque motor into a single assembly. This combination permits extraordinarily smooth motion control for high-precision positioning and measuring tasks. The angle encoder module with integrated drive motor is optimized in particular for the exacting requirements of metrology applications. For this purpose it features very high resolution and excellent repeatability, even when operating temperatures vary. All single components of the SRP 5000 are sourced from the HEIDENHAIN Corporate Group. HEIDENHAIN produces the bearing and the high-precision encoders for the angle encoder module itself whilst the torque motors including AccurET controller are provided by ETEL. This close collaboration ensures a perfect matching of the functional groups. HEIDENHAIN presented the LIP 6000 exposed linear encoder with interferential scanning for linear position detection with excellent accuracy and especially compact dimensions. The very small interpolation error of only ±3 nm, a low noise level of only 1 nm RMS and a base deviation of less than ±0.175 μm in a 5 mm interval enable either very constant speed control or high position stability at standstill. These properties of the LIP 6000 are thanks to the new HEIDENHAIN signal processing ASIC HSP 1.0, among other factors. This ensures the consistently high quality of scanning signals across the complete life expectancy of the encoders. The HEIDENHAIN signal processing ASIC continuously monitors the scanning signal for this purpose. If contamination on the measuring standard or scanning reticle results in signal changes, the HSP 1.0 almost completely compensates the resultant deviations to establish the original signal quality. Interpolation deviation and position noise do not increase as a result of contamination during operation. The signal amplitude stays nearly constant at 1 VPP. Even when there is a high degree of signal stabilization this hardly affects the noise level in the scanning signals—quite contrary to systems in which the gain is made in the signal path, which increases the noise level. HEIDENHAIN presented its new QUADRA-CHEK 2000 evaluation units for daily measuring tasks during finished part inspection with manual initialization. Point measurement is implemented on profile projectors, measuring microscopes and 2-D measuring machines via a crosshair or optical edge detector. The measuring results are displayed graphically on the touchscreen and, thanks to intuitive operation, can be simply recorded in measuring logs. With its robust embedded design and compact housing the unit is ideal for workshop use, and can also be simply integrated into the company network. Connected Machining individually and flexibly connects the production department with the company network via the NC control of the machine tool. This way the operator at the machine tool has direct access to all data and programs that he needs in order to work. Also, he can provide other areas of the company with important information from the production floor online. A demonstration unit at the HEXAGON booth in Hall 5 showed how the new and intelligent HxGN Smart Quality quality-management system from HEXAGON can be used to integrate a machine tool in the network via a HEIDENHAIN control, making direct exchange of data between production and metrology possible. For more information, please visit http://www.heidenhain.de.